The new thermoelectric model has improved capacity of 20 litres, which allows two-litre drink bottles to stand upright in the box. When in cooling mode, the box cools to a maximum of 18C below ambient temperature. The box can also keep hot food warm to a maximum of 60C. 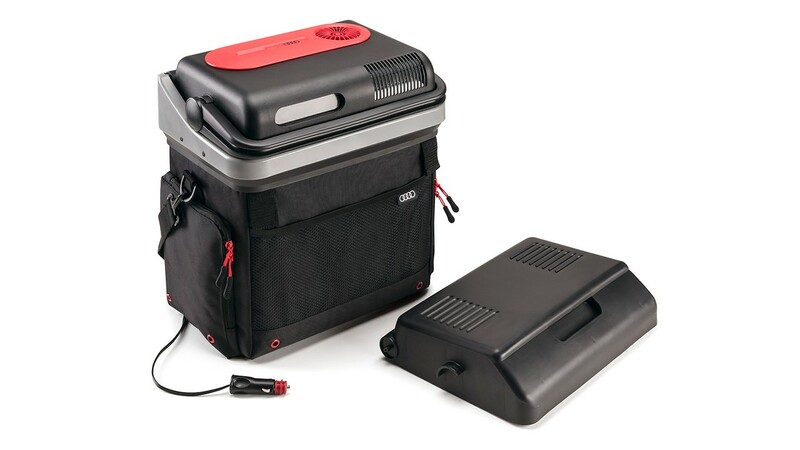 Stored food and drink will be kept cold or hot throughout the journey when the box is plugged into a 12-volt socket. The new box can also be used as a conventional cool box with an even larger 25 litre capacity by using a separate lid (supplied) and ice packs (not included). A carrying strap allows ease of use away from the car and the box has various external pockets for anything that you may need during a picnic. Generous. Capacity at least 20 litre. Flexible. To cool or keep items warm. High quality. Specific Audi design.